One of the programs the Nicaragua Covenant supports is education, as a way to help impoverished people confront their circumstances. Supporting primary education has been a major Covenant program for twenty-three years. The Covenant currently supports thirteen teachers in eight primary schools serving 750 children. 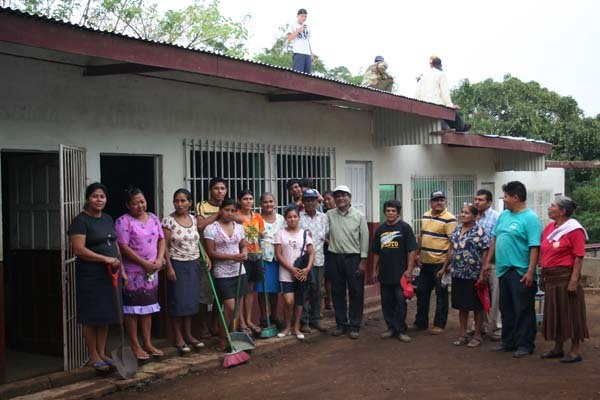 Mission teams from New England renovated and resupplied Sierra Maestra, El Nazareno, Camino a Emaus, Cincoyo, and Las Flores schools. Supported chools are located in: Ciudad Sandino, Cincoyo, Camino a Emaus [San Rafael, Tipitapa], Maranatha, , Sierra Maestra, La Cruz Verde, El Nazareno. This was a total school makeover. A new roof, new sheetrock, all electrical replaced, bathrooms rebuilt, and all new desks, cabinets, and teacher supplies. The school received a new roof, all classrroms were painted, new desks for all classrooms, classroom supplies for students and teachers. The school was given a fresh coat of paint inside and outside, and a new classroom was added. Whiteboards were installed in the classrooms and 60 new student desks were purchased. The team took the principal on a shopping trip to the school supply store and a multitude of student and teacher supplies were purchased. The school shines and the principal later advised us that enrollment was up substantially as the result of the team visit.